What should we think of the Washington Capitals? What should we actually think of the Caps? Slowly, surely, over the course of the whole season, the Washington Capitals have proven their quality once again. At least in theory. They’re on their way to another easy 100-point season and under Todd Rierden, they’ve actually taken a bit of a step forward in terms of their process. That is, they still give up a little more quality-and-quantity per hour of hockey than they generate (minus-0.12 expected goals per 60 in all situations) but that’s better than what it was last year. And of course, the thing that needs to be hammered over and over again is that expected goals are only weighed against the league average, and Washington has a boatload of talent that allow it to outperform league-average metrics year after year. Maybe that stops happening a year or three from now, but it isn’t happening now, and for good reason. A team with this much skill is always going to convert on more of its chances than its opponents, which is arguably as important as just being able to generate those chances in the first place. It’s not like they’re a 42 percent CF/SF/SCF team. They’re slightly on the wrong side of 49, and it doesn’t matter much. Alex Ovechkin may be slowing down in a lot of ways (check out those not-good underlyings), but scoring goals ain’t one of ‘em and that’s what you pay him for. Nick Backstrom is having another great year. Evgeny Kuznetsov took a step back but you don’t argue too much with a 70-point season. Same can be said of John Carlson. T.J. Oshie is at least still a finisher who moves the needle for you too. 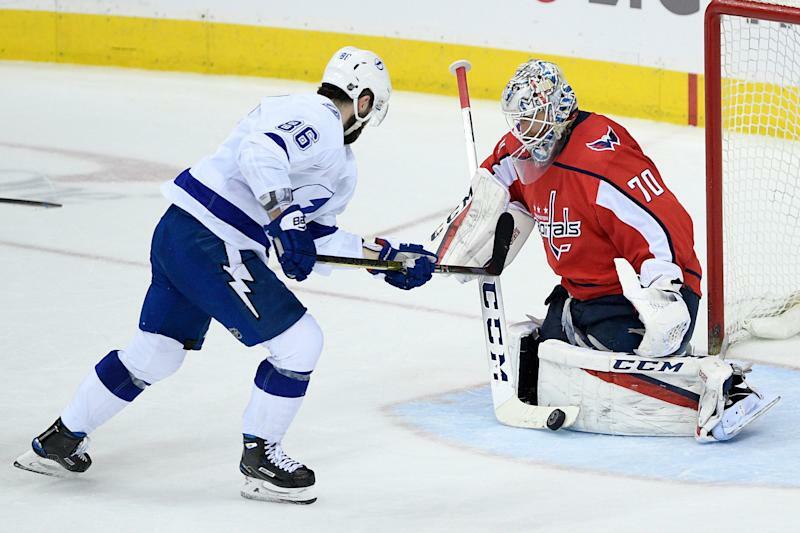 And Braden Holtby hasn’t been good (.907 for the second straight year) but with the league average coming down, it hasn’t hurt the team as much. Underperformance from Holtby and Pheonix Copley have probably cost the Caps less than a single standings point, effectively nothing. Last year Holtby was actually a little better versus expected, but Philip Grubauer’s great season was what kept the Caps afloat. Well, again, there is the talent factor to consider. Maybe Holtby’s washed and maybe he isn’t, but he was great in the playoffs last season and that’s also his broader track record. He’s also not at the point in his career where you’d expect him to decline; 28 is not the age when goalies suddenly show up to camp having totally lost it. Especially if they’re as good as Holtby was in his early and mid-20s (.923 across almost 10,000 shots against in the regular season and playoffs before last season), albeit on a consistently very-good team. Compare that with the track records for Robin Lehner and Thomas Greiss. Both very solid “1b” kinds of goalies, often on rather bad teams, but certainly not the kind of guys you’d expect to see go a combined .927 or so over the course of a season, either. You can draw the same kind of distinction for most guys on the Islanders outfield roster: Mat Barzal has a track record as a scorer, absolutely, but this season he’s well under a point a game, and this is a club that’s likely to only have four players finish north of 40 points. A lot of these forwards are perfectly good NHL players but they’re not the galaxy of All-Stars the Caps have up front. Same goes on the blue line: You can like a few Isles defenders quite a bit, but they don’t have the resumes that Carlson and Matt Niskanen do, just to pick two examples of guys I’d take before the best Islanders defender. The Caps have seven forwards at 40 points already, and both Tom Wilson and Lars Eller could pass that mark in the next few weeks. Wilson, by the way, missed 18 games due to that suspension. Three have more points than Barzal, and by wide margins. There is also, obviously, the proof of concept: Washington won a Cup last year, and beat the Lightning to do it. It’s therefore relatively easy to see these guys at least doing a little better in the playoffs than a team that hasn’t been there since 2016. Doesn’t mean you have to be a 100-percent Caps believer; I certainly wasn’t last year. And despite the outcome of the 2018 Eastern Conference Finals, I don’t buy them as being able to reliably beat even that non-juggernaut Bolts team in any number of seven-game series, but you only gotta win one. So I’m not really buying them as a legit contender this year either, but you have to acknowledge two things: 1) They lost their great coach to a division rival and didn’t miss a beat, still looking like an above-average NHL team. And 2) They looked phenomenal against the Lightning on Wednesday night. Y’know, against that team that’s scored 11 goals against them in two games so far this year.